The attorney friends talk about their respective busy case loads as well as recent vacations. NEW YORK—Sources confirmed Tuesday that local attorney friends Sam Taub and Peter Glickman unexpectedly met near the main entrance of New York County Courthouse and caught up on family, health, and their careers while quickly descending the building’s 16 front steps. The brief 25-second discussion reportedly began at approximately 3:45 p.m. when the two colleagues firmly shook hands and expressed some measure of surprise and delight upon seeing one another. Onlookers said that just as they began their brisk walk down the granite steps, Taub, 41, patted Glickman, 40, on the back. When they reached the middle courthouse step, Taub reportedly mentioned the name of the judge assigned to his case—Judge Paul Warman—which prompted Glickman to make a sarcastic remark and Taub to simultaneously laugh, roll his eyes, sigh, and shake his head. Sources later confirmed that while they were descending the stairs, Taub’s suit jacket was draped over his briefcase-carrying arm, while Glickman was wearing his. 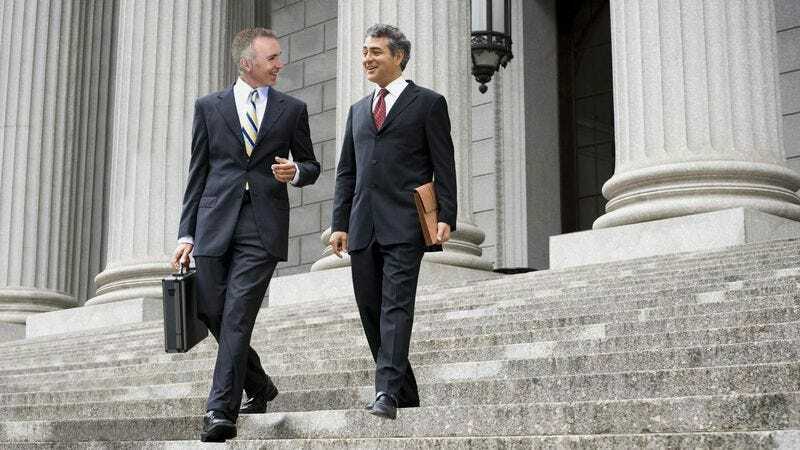 According to courthouse officials, this isn’t the first time the two attorney friends have gotten up to speed and shared a few laughs while quickly walking down the courthouse steps. On Nov. 8, 2012, Taub similarly greeted Glickman and the two discussed business and how nuts their houses were going to get over Thanksgiving. During another brief discussion on Sept. 2, 2011, Glickman reportedly paused on the sixth step when Taub mentioned that his then 6-year-old daughter Sara was experiencing some health problems. Onlookers said that as the two reached the bottom of the steps, Glickman told his friend that he was late for a meeting back at the office. Both attorneys agreed, however, to get dinner soon and “play a round” at the upstate New York country club where Taub’s boss Perry Baker is a member.